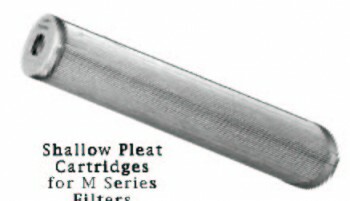 The RD-M1 to M6 filters use a standard 2.5″ diameter by 29″ long cartridge. Even though 29″ cartridges are normally used in the M1 filter series you can alos use three, stacked, standard 10″ (9.75″) cartridges in the same chamber. This design flexibility allows for many options. Our 29″ cartridge are made of polyester which allows maximum reuse in either fresh or saltwater. Standard pleated polyester cartridge last 1 to 2 years before replacement. Use between pH of 3 to 11 and temperature to up to 140 degreesF and pressure of 80 psi max. 1/2″ deep pleats.